How did a 375 lb. 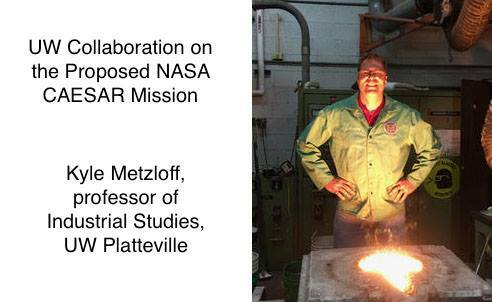 iron weight cast by students at UW-Madison and UW-Platteville help the CAESAR Mission get off the ground and become one of two finalists in a NASA proposal? If selected, CAESAR, which stands for Comet Astrobiology Exploration Sample Return, would visit the Churyumov-Gerasimenko comet and collect a small sample of its surface material. Led by Dr. Steve Squyres, principal investigator on NASA’s Mars exploration rovers, the device could grab at least a 100-gram sample from the nucleus of the comet and deliver it back to Earth in capsules to help demonstrate how the same materials contributed to early Earth.